Is there any way to create a custom sort/statistic. I'm interested in tracking total time and dives for CCR and OC dives (and just for grins I've got a couple of SCR dives as well). I'm really new to this program so I don't know to create a custom statistic (if its possible). This is currently unfortunately not yet possible. You can use the Diving Log Viewer to create some custom statistics, but the new columns like CCR are not yet implemented there. Ah. I see that I'm getting ahead of the implementation in some of my questions. Now that I'm can use Access (as opposed to SQL, many thanks again) to look at the database, I can see where the data is kept. So I guess my question is where in the database are you keep the OC/SCR/CCR information? Right now it looks like that information is not kept in the Logbook table. I'm trying to think of a work around so that I can track this information in the database until (or if) you get it implemented. What do you think of me using the Divetype field for this in the interim? I see it now, and understand how the data is being used. I do have a feature request if you don't have it already. 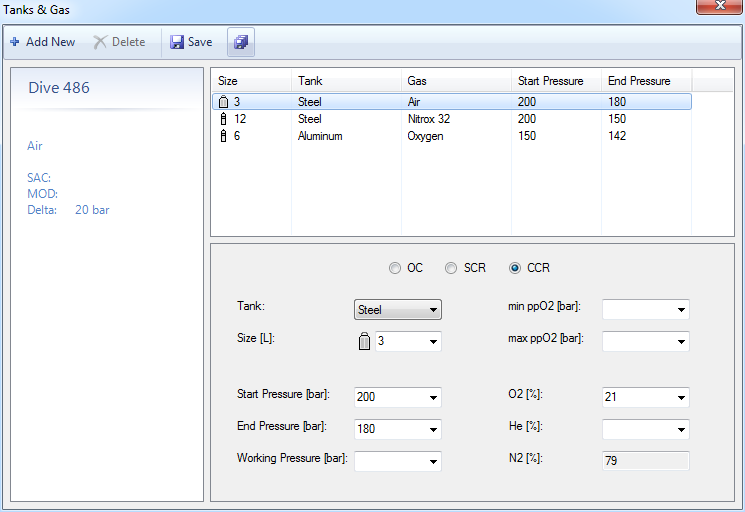 I would like to see the OC/SCR/CCR information (the SupplyType field) for tank 1 also appear on the logbook page in the Extended Layout 2. This would make it real easy to see what type of dive this is or starts off as.